Many people think of creativity in terms of painting a masterpiece or drawing a flawless self-portrait; but creativity can be anything from creating a new entrée from scratch to submitting an original idea during a work meeting. Walking is usually associated with exercise, but it can also boost creativity. Take a 20 minute walk and allow the world to just be. Leave your electronics at home. Watch things. Stop and smell the smells. Notice wildlife and all the beautiful things around you! Another way to boost creativity is experiencing new things in your every day life. Always watch comedies or read mystery novels? Try switching it up and rent an action-filled flick or read a romance novel. The best way to do this is take photos. And I don’t mean the normal stand-and-click type of photography. Get dirty. Lie down on the ground and shoot from foot level. Or climb a tree and see how the world looks down below. Seeing things in a different way will not only open your mind but it will also make you more willing to try new things and be less intimidated by things that are different. I have heard it time and time again, “I don’t have a creative bone in my body.” But I believe everyone can become creative in their own way. When people think of being creative or being an artist they always seem to think about painting, drawing, sculpting, or crafting. Maybe you cannot draw an exact picture of your dog, but you may be strong in another area of creativity. When I say be more curious, I am not saying question and over-analyze every little thing. But it is important to keep your mind going. Next time you are applying for jobs, don’t just look into what your field of study is. Explore other options and see what is all out there. It could surprise you! Have you ever gone to a photo gallery and wondered, “How is that even art?” Well, it’s because art is very subjective. You will start to notice a slump in your creativity when you are constantly trying to make your creations or projects “perfect”. Not having as many expectations will leave room for risks and new ideas to surface. Doctors Carrie Barron and Alton Barron, authors of The Creative Cure, advise us to step away from the keyboard and pick up a pen instead. Writing with a piece of paper and a pen can actually be very calming and peaceful. And sometimes the whole experience of writing by hand will get the creative juices flowing. Sometimes when we are stuck in the same office or room, our creative juices can stop flowing. Your boss wants you to come up with a new design for the company flyer and all you have is a blank sheet of paper? Step out into the hallway or lounge to change your environment up a little bit. Meditate – The perfect cure for a mental rut! It promotes divergent thinking, a state of mind in which we’re able to generate new ideas. Get other opinions – Getting other people’s perspective may give you new ideas and start a new stream of thought. Look at something blue or green – The colors tend to improve performance on cognitive tasks. Research has shown that we associate blue with the ocean, sky, and openness in general, while green signals growth. Different colors are very powerful for the process of creativity! Laugh – This will not only put you in a better mood but will clear your mind as well. When we are stressed or worried about things, our minds can get fogged. Lighten up a little bit and you will see your creativity sky-rocket! Make a Creativity Board – Find photos in magazines, quotes online, or anything that inspires you and post them onto a poster or cork board. 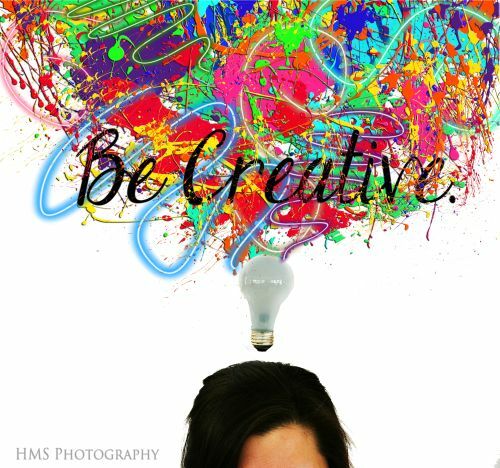 Hang it up in your office or the place you need a creativity boost. If you want more tips on boosting your creativity or have questions about health and wellness, feel free to email me at MediaCLD@uww.edu and use “Health and Wellness with Heather” as the subject heading. This entry was posted in Health and Wellness and tagged Heather Schwartz by Heather Schwartz. Bookmark the permalink.